How long more will telecom wars in India continue ? How can the different telecom revolutions be classified ? Telecom Revolution 1, revolved around the analog telecom technology and exchanges where access was limited to the elite few, mighty and powerful. Telecom Revolution 3, as we see it now, revolves around the affordability and cost aspects of telecom technology. Hardware players are competing with each other to offer the customers the best in terms of equipments and high speed phones, not to forget the telecom operators who have hijacked the cost aspects to offer the customers the best they could never even dream of. In the area of telecom India has been doing quantum leaps, the term leapfrogging would be most apt and ideal to describe India's performance of late. India has escaped the heavyweight bag of having to carry old, developing technologies of half a century. It has instead leapfrogged to accept the latest and fast fourth generation telecom technology which has penetrated the cities, towns and country side across India like wildfire. Mukesh Ambani is into Tsunami Innovation ..
Special mention needs to be made here of the effort by a few forward looking, competitive, truly customer oriented companies like Airtel, Jio, Vodafone and Idea, not forgetting the state owned BSNL who over the past two years have been going out of their way to serve the Indian customer to the hilt, even at times staking their very survival in the Indian market. Never have customers in any part of the world been served and patronised so whole heartedly, so selflessly and so patiently by corporates who have gone beyond their call of duty to serve the Indian customers. 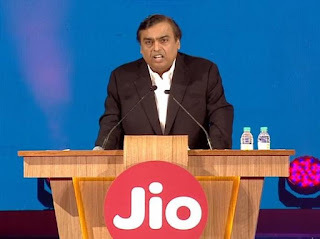 Even though a little credit could be given to Reliance Jio for having set the mood and temperament of extreme customer service in the Indian telecom market, the other major players also need to be credited equally well for the support they have given to Reliance Jio to help serve the Indian customers the best. Costs tumbled, calling within the country from any corner to any corner for how much much ever time became free (the only country in the world to do so..), probably because there was an excess of capacity over demand. The existing demand was limited to the cities and towns which constituted just 30% of the Indian population, with the rest 70%, informed and enthusiastic, waiting to join the bandwagon, the only impediment being costs. With the wilful and unselfish joint effort by all the major telecom players of the country that hurdle has now been removed. Indians from the very weaker cross sections of society to the super rich have got equally unfettered access to free telecom calling from any part to to any other part of the country for how long one wants to. No country in the world could match up to this offer even at any point in the near future. What was the basic reason for this bonanza for the customers ? Telecom bandwidth capacity of the optic fibre type has been laid right across the country by the telecom major Reliance Jio outstripped demand. In fact, Reliance Jio has invested the maximum, to the tune of almost $33 billion, funded by the market, the highest by any telecom player in any part of the world in telecom infrastructure ever..
To top it all, Reliance Jio as part of its Republic Day 2018 offer, has given attractive tariffs making calling across the country, as cheap as Rs 49 ($ 0.75) for a period of 28 days with a GB of 4G data to go with it. An unbeatable offer !! Lets wait and see how the other major players would either scramble for cover or wholeheartedly and selflessly come to the forefront yet again to serve the Indian customer. Good wishes to all of them and many more years of free calling for the Indian public ..